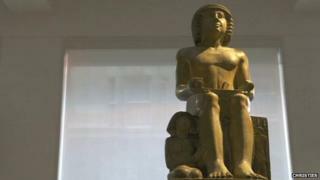 An Egyptian government minister has called on the citizens of his country to raise the £15.76m needed to buy an ancient statue sold by a UK museum. Northampton Borough Council sold the Sekhemka statue to an overseas buyer in July 2014, but the British government put a temporary export ban on it. Antiquities minister Mamdouh el-Damaty said Egypt should buy the statue. The UK Department for Media, Culture and Sport said it could not comment on this development. A spokeswoman said: "In view of the Sekhemka statue's significance, the UK government has provided an exceptional extension to the initial deferral period in the hope that it can be saved for the nation. "This export bar could be further extended until 29 March if a serious intention to raise funds to purchase the statue is made before 28 August." Arts Council England says "it's possible" a new buyer within the UK may be found. The 4,000 year-old statue dates from the same period as the construction of the Giza pyramids. It left Egypt in 1849, bought by the second Marquis of Northampton, Spencer Compton, whose son gave the statue to Northampton Museum. The council said the temporary bar had "no impact" on the sale of the statue, sold at auction to fund an extension of the town's museum and art gallery. Mr el-Damaty said the British export ban would expire on Friday, meaning it could end up in a private collection unless Egypt could buy it. Egypt, home to a massive wealth of ancient antiquities, banned their sale in 1983. "What this museum is doing is considered an ethical crime against human and Egyptian heritage," Mr el-Damaty said. He said this was the first known sale of an Egyptian antiquity from a museum, adding that Egypt had halted all dealings with the museum in protest of the sale. The UK government is trying to find a local buyer to be able to keep the statue inside the United Kingdom.